If your astrological sign is a Taurus, tribal tattoo symbols may be the perfect, meaningful yet artistic design idea. While it's true that tribal tattoos are some of the most popular design styles in the tattoo industry, that doesn't mean your piece can't be unique in its own way. A custom tattoo design will always have more meaning than a standard piece of flash art, and the sign of Taurus lends itself to many eclectic tribal design options. While tribal tats are typically black and composed of an assortment of fine lines and sharp strokes, you can add coloring and shapes to make your tribal piece even more interesting. Tribal tattoos have been worn since 2000 B.C., so while the trend may be going strong, the longevity of this tattoo style proves its timeless place in the world of body ink. If you were born between April 20th thru May 20th, Taurus the Bull is your astrological sign. Your reliable and practical nature prove a tattoo design should be significant and well thought out. Taurus is loyal, laid-back, free-spirited and trustworthy. Although stubborn as a bull, your friendly nature makes you outgoing and a positive joy to be around. Those who know you are aware of your hard-working and ethical nature. While the sign of the Bull may not be the most spontaneous, Taureans certainly appreciate luxury and living the good life. Never one to push the envelope, a Taurus tribal tattoo symbol will appeal to both your earthy element and fixed zodiac quality. 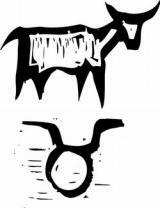 Tribal tattoos can be used to highlight some of Taurus' unique zodiac traits. If you plan on opting for a personalized tattoo, do some local research and find an artist who specializes in custom pieces. It would be helpful if the artist also has a keen interest in tribal work. Tribal pieces are rich in culture and history, so feel free to blend some heritage into your own personalized design. Here's just a few ideas to get the creative juices flowing! Bull glyph The bull glyph symbolizes the Taurus zodiac symbol. Simplistic and consisting of only a curved linear rack and a circle, the glyph can be used alone or set in a tribal band for a unique and personal tattoo design. 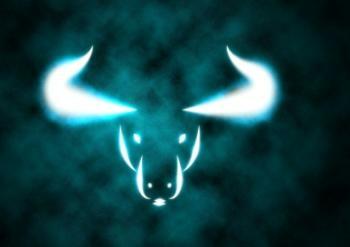 Bull: The most obvious choice for a Taurus tattoo is that of the bull. A talented artist can design a tribal bull that incorporates ancient symbols. If you have a Native American heritage, you'll have plenty of options for blending both your culture and zodiac symbol into a tribal bull tattoo. Stars: For a feminine zodiac tribal tattoo, consider opting for a constellation or a star pattern depicting the bull. While the bull shape is masculine, you'll find small stars add a feminine, delicate and ethereal nature to your sign. Keys: If you want to be the center of the latest trend design, consider flaunting a tribal skeleton key. Keys can symbolize a variety of meanings, including rebirth, wealth, protection and love. A tribal bull can be carved into the top of the key to create a home-loving, Taurus-worthy symbol. Calligraphy fonts: If you want a classic and strong tattoo design that compliments your practical side, why not opt for a lettering piece? Choose a tribal-style font with lettering spelling out Taurus; this is an easy and wearable piece sure to stand the test of time. Tribal zodiac tattoos always draw attention, so make sure you display your piece on an area that's visible if you want to talk astrology with strangers. Tribal tattoos are perfect for the wrist, shoulder and back. Once you have a workable design idea in mind, you can meet with a reputable artist and discover which placements will work best for the tattoo imagery and style. Although tattoos are a permanent piece of artwork, a zodiac themed design is perfect for the predictable Bull who wants to take a "cautious" walk on the wild side.